M60 is the most famous 7.62 mm caliber United States machine gun. Moreover, M60 is a family of American general-purpose machine guns. 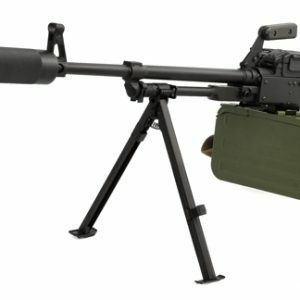 M60 machine gun was introduced in 1957, it has served with every branch of the U.S. military forces and still serves with other armed forces. Laser tag M60 machine gun set is based on airsoft body. Due to metal parts, the weight of the model reaches 15lb. Game set uses lithium battery as a power source with a capacity of 2.2 Ah, providing up to 30 hours of battery life. Reload is done with the breechblock. 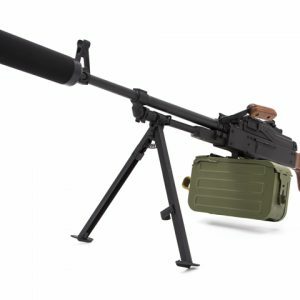 M60 laser tag machine gun is equipped with a bipod, gun-carrying handle, and removable breech casing.